ZF Friedrichshafen AG recognizes its best suppliers with the ZF Supplier Awards. At the Global Supplier Summit, seven suppliers received prizes spread over four different categories for their outstanding performance. The award for the best service provision in the digitalization sector was new and premiered this year. "Innovative and financially sound suppliers with a global name are the backbone of our company's success", stated Wilhelm Rehm, a Member of the Board of Management at ZF who is responsible for materials management at the technology company, among other elements. In the midst of the global megatrend for advancing digitalization and increasing electromobility, ZF is pursuing Vision Zero (the reduction of road accidents and emissions) with passion. ZF needs a supplier base with an international production structure for the new products and commodities that result from Vision Zero. "Reliability and quality are the most important aspects here", added Rehm. This year, around 300 ZF specialists and executive managers, along with representatives from the most important suppliers, met at the Global Supplier Summit at the ZF Forum in Friedrichshafen, the Corporate Headquarters of the Group. The event was an opportunity to share knowledge and discuss strategies on purchasing and logistics. The ZF Materials Management team also used the event to honor its outstanding suppliers. 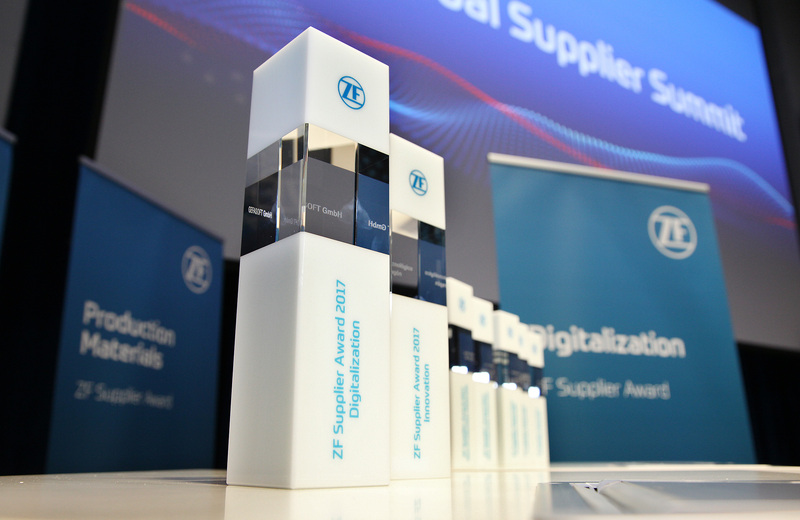 The technology company gave a supplier award in the Digitalization category for the first time. The winner was Gefasoft GmbH : an IT company from Munich that leads innovation for online data exchange which won over the jury with its transparent presentation of information which boosts the efficiency of processes. Together with ZF, Gefasoft developed a platform to digitally visualize and optimize work processes within production. This data enables processes to be analyzed and optimized using the tool. This increases responsiveness in production and improves capacity utilization for the systems. Three companies won an award in the Production Materials category this year. The Hella Group , which supplies ZF with sensors and other elements and entered into a strategic partnership with ZF in the summer of this year, scored points because of their technological leadership and the amazing support that they provide for engineering. This family firm from Lippstadt is listed on the stock exchange and is represented at 125 locations in over 35 countries. The Hella Group also showed that it was flexible in terms of the ZF Group's localization requirements. Another winner in this category was Ningbo Sunny Automotive Opotech . The company belongs to the Chinese Sunny Optical Technology Group. The group produced around 80% of its 2016 sales with optoelectronic products which are used in vehicle cameras, to give an example. Sunny, the world's biggest camera lens manufacturer, is a strategic partner of ZF for many components, including those in the LIDAR technology sector. This manufacturer won the award for their outstanding product quality and performance as a supplier. Competitive product prices were also a crucial factor in winning the awards. The French supplier Lisi Automotive , which supplies a total of 55 ZF plants with anchorage systems and forming technology, is a strategic development partner for the technology group and the third prizewinner in the Production Materials category. The Polish special-purpose machine manufacturer Pemes Sp . won an award for Non-Production Material. The company is headquartered in Warsaw and has a global network of cooperation partners. It supported the Active and Passive Safety Technology Division at ZF in establishing an innovative and cost-efficient airbag production process. The second award winner in this category was the Kempten-based logistics company Dachser . This company is a world market leader in system logistics and has a tight global transport network. The Group was honored for many things, notably its excellent logistic services and well-marked communication skills as well as a high level of cost awareness. The award in the "Innovation" category went to the Spanish Instituto Tecnológico de Aragón . This technology center from Zaragoza advises ZF on matters related to innovative engineering and made a considerable contribution in revamping the technological processes within the Group and speeding them up. For example, the Instituto Tecnológico de Aragón used its expertise to support the virtual development of a new brake system. 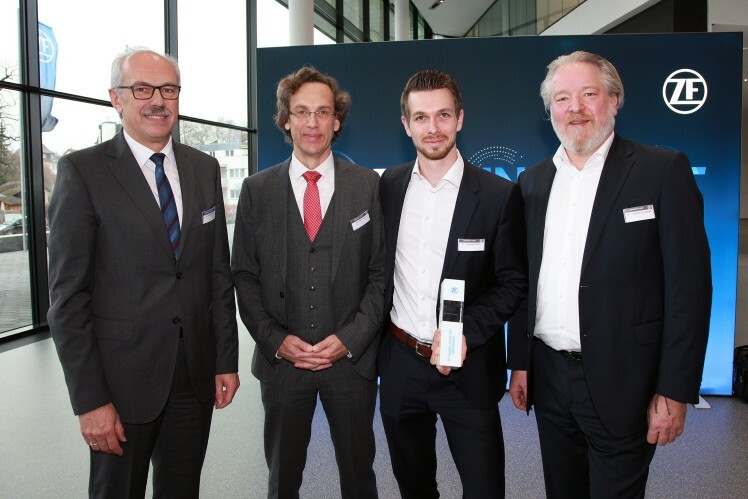 ZF Member of the Board of Management Wilhelm Rehm together with the award winner for the "Digitalization" category: Franz Fuchs, Christoph Schiffer und Christian von Stengel from Gefasoft GmbH (from left to right).